Yes, it’s been a little while, again. 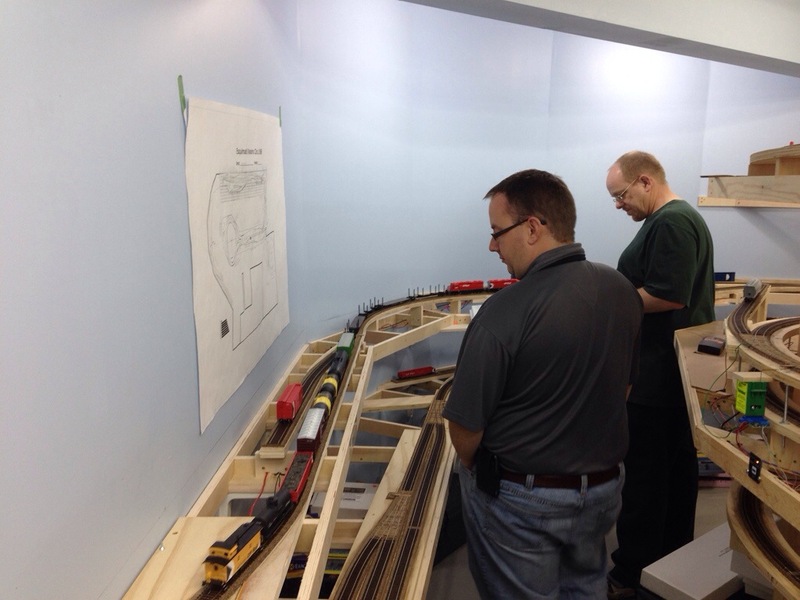 Still busy with SUPERTRAIN stuff, but I have been trying to keep progress going forward in the basement. Maybe not really in the trackwork/benchwork realm but in the rolling stock. I now have three skeleton log flats which are nearly ready for decals and a couple 50′ long flat cars suitable for idler flats. More on the five pack later. Cam has also been really busy over the week getting all the last details added and painted on 3000 and 3004, in preparation for the ‘Homecoming’. Friday night he escaped from work a little early and came with me to Dave’s place to get some last minute touch-ups and details done. All tested and these things are awesome. The next day (ie: Saturday/today according to my dating scheme here), I was busy doing a ton of cleaning in preparation for the party. Cam arrived around 1pm and we got to work on niggling issues with the layout…specifically the problem turnouts, at Parksville and ICG Nanaimo. The former was needing rails spiked to the ties and some minor adjustments, the latter needed to be shifted and spiked. Will still need some work, so some flags (aka yellow and green pushpins) were setup and and a Daily Bulletin was issued to advise of the slow order through the turnout. I also did a thorough vacuuming of the track and thought that would be all. Not quite as it turned out. Guys started showing up just prior to the appointed time and the layout was deemed okay to turn on (oh yeah, forgot to mention… A fair number of frogs in the staging yard needed gapping) and the locos were fired up, assigned and coupled up to the Courtenay turn and Cam had the Honours to be the engineer to run the train containing a lot of his work (3000 and 3004, as well as the skeleton log flats) out to the end of the line and back. 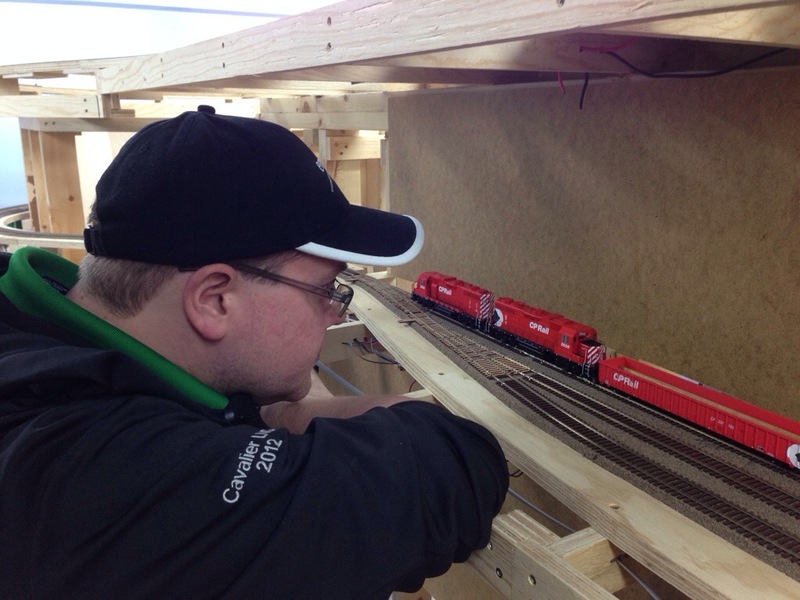 That’s Jeff Simpson in the foreground admiring the train with Cam running in the background. This entry was posted on January 14, 2014. It was filed under Unassigned. Lazy so and so…how are you going to finish the E&N if you become a traitor and go work on building Union ??? I suppose I need to get on with Long Marton – I have a visitor from the Toronto area who is coming out here on the 23rd of March for the BRMoV meeting. I would like to get both directions working for the signalbox. I was there to ride the length of the Algoma Central before I couldn’t. Spent a couple days before those pictures were taken riding between Sault Ste. Marie and Hearst, Ontario and riding a flagstop train. That train’s service is due to end completely at the end of April (was March before), and I figured if I’m headed that far to do that that I would take a couple extra days to spend with friends. More updates to come when I can find time.